There are currently four earth-sheltered cabins at the Well Being Conference Center which are available for personal retreats, weekend getaways, quiet interludes from a busy world, or for just enjoying the peaceful and natural setting on the Powell River. The Cabinettes are insulated and heated. For cooling during the summer, we have situated them beneath mature trees, have provided plenty of cross-ventilation and have installed a very quiet exhaust fan. The beds are very comfortable and towels are provided. Our cabins are fully furnished and come complete with wi-fi and satellite TV. Our facility is a family oriented marina located on Norris Lake in Speedwell, Tennessee. You'll find everything you need for a relaxing vacation, a weekend getaway, or a reunion with family and friends at River Place on the Clinch! 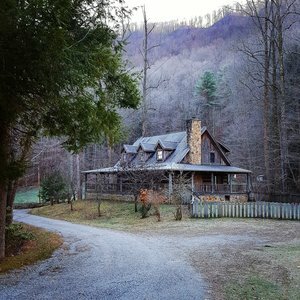 We have six fully furnished cabins located on the beautiful Clinch River in the Historic Kyles Ford Community. We also have one primitive fishing cabin with facilities within walking distance. Our cabins are cozy, comfortable retreats, each with a satellite TV with VCR / DVD player, a hot tub on the private deck overlooking Norris Lake, and a charcoal grill. They’re stocked with fresh sheets, blankets and pillows, as well as towels, washcloths, soap, and shampoo & conditioner for your convenience.